(ThankYourBaby.com) – As parents prepare for the coming of the baby by buying all the things needed, priority is given to the items that will ensure the safety of the baby. The convertible car seats no doubt take their own place in the list of the safety and must-have items for the baby. With many brands out there all showcasing quality car seats, you need to know the best convertible car seat for small cars and for your baby. To make it easier for you we have outlined a list of the ten best convertible car seats for compact cars. Is The Second Hand Convertible Car Seat an Option? This is a very durable car seat designed to hold baby safely in place during travel. The baby can use it right when he is a newborn until when he is 10 years old. It is not only comfortable thanks to the plush inserts, but it can also be beautifully transformed from the rear-facing infant car seat to this backless belt-positioning booster. It has this safe adjust 5-point harness system that effectively adjusts the height of the harness and headrest in a single motion, ensuring that the baby is well secured in place. The seat has also taken into account the comforts of your child, evident in the existing cup holders to help keep his drinks and snacks within reach. The many safety features also further make this convertible seat very special and a favorite for many parents. It has this steel reinforced frame for durability, an energy absorbing foam and it has met and exceeded all the US safety standards. The steel-reinforced frame perfect for fixing the car seat in the rear of the car for safety. Multiple recline positions to further ensure the child’s comfort whether they are newborns, toddlers or in grade school. It is very compact, measuring only 20” wide and can perfectly fit inside small cars whether in its rear-facing or forward-facing modes. Pressure marks can sometimes cause damage to the seat of your car, but this car seat has that taken care of thanks to is the smooth and solid bottom. Tightening the harness could be difficult when the car-seat is in the rear-facing mode. It lacks shading for the sun which can make baby uncomfortable during the sunny days. Setting it up can be a little complicated for some parents. This is a great car seat for small cars and fits in newborns perfectly. The overall dimensions make this car seat ideal for parents with babies from 4lbs to 70lbs with up to 40lbs for the rear-facing mode. Your baby is also well catered for when it comes to snacks within reach thanks to the gripping cup holder that is able to securely hold beverages and other snacks. The safety standards have been greatly considered during its manufacture as evident in its air protect technology that releases air whenever a collision occurs, therefore, reducing the impact. The harness also has micro adjustment options to ensure that any baby who sits in, is well secured. There is also a one click latch system, with an easy click-in and release for better installation. One click latch system, with easy click-in and release for better installation. Gripping cup holder, integrated to securely hold beverages and snacks. The Tiny fit system allowing any baby to fit in securely and comfortably. The AirProtect side impact mechanism that offers protection in the event of a collision. 3-position recline to allow parents to make the needed adjustments based on the height and weight of their baby. Comes with infant support cushions such as the head pillow and hip support for maximum comfort to the baby. The harness could be difficult to adjust for some parents. Doesn’t fit well in all small cars, for some, it is bulky and might take a good section of the backseat. The fabric has to be hand washed something that some parents would not like. If you love safety, then this is the car seat for you. It is one of the car seats with a full steel frame, aluminum reinforced sides, energy absorbing EPS foam and a strong safe stop harness system, the safety of your child is assured. This car will also grow with your child and will eventually convert to a booster when the child grows older. It is also convenient for travel since it can fold flat and fit 3 across most mid-sized cars. This is ideal for families with more than one toddler and it is even FAA approved for airplane travel. The adaptable design that allows it to cater for children throughout infancy to toddlerhood and beyond. Offers maximum comfort for baby and narrow enough to put it and two other people on the backseat bench (in most mid-size cars). Very easy to install thanks to the super LATCH system and a visual indicator that allows you to know when the seat is properly locked in position. It folds flat making it convenient for storage and travel. Solid construction meant for durability. With 26lb of weight, this car seat is too heavy making it a challenge to move it around especially if you keep changing cars. Tough to wash, better to invest in a seat protector. Lacks a cup holder for your child’s snacks, therefore feed your baby well before leaving or else you will pack at the side of the road to feed him first. Lacks head pillows on the sides in case baby falls asleep. As its name suggests, safety indeed comes first in this convertible car seat which is ideal for most small cars. It has an impact protection Air Protect mechanism to protect the baby during an accident. It also features a 5-position adjustable headrest and a single-step harness adjust system and plush cushioning for maximum comfort for your baby. You can use it in a rear-facing mode for babies from 5lbs to 40lbs and the forward facing mode on toddlers from 22 to 65lbs. The Air Protect crash protection system to protect against collision impact. A removable fabric pad that makes cleaning easy. An extra insert of removable padding to offer maximum comfort for your baby. The integrated LATCH system that makes it easy to install. Compatible with most of the small car types. As much as it fits most small cars, it does not allow the installation of more than two seats in the back seat area of most cars. Very inconveniencing if you have three babies and own a small car. There have been issues of parents feeling that the seat looks safer in front-facing mode than the rear-facing mode. Lacks a recline which can be a disadvantage for napping babies who love reclining a little. Most car seats can be difficult to install with a lot of latches requiring lots of heaving, tugging in order to get them secure in place inside your car but not this one. This car seat actually comes with two bubble level guides, a single one on each side of the car seat to help you see when you have gotten your installation right. It comes with 9-recline positions and its size is compact enough to fit in most small vehicles compared to most convertible car seats. It is easy to clean with a seat pad that allows you to zip it off and clean it. It is also convenient for your hungry toddler who might needs snacks from the insulated cup holder. Lastly, the design is beautiful and the 6-position headrest comes with an integrated harness adjustment to cater for your growing baby. Awesome safety features that that will make you at ease about your baby’s safety. Very easy to install, actually one of the easiest convertible car seats to install in the market. Has two ride right bubble levels that will show you if you have installed the seat in the correct angle for both rear-facing and front-facing modes. A breathable fabric which is great for hot summers which require the baby to remain cool. The deep walls of the seat can make your little one too warm during hot weather because they might trap heat. The cover of the seat comes off but it doesn’t come off easy you have to fiddle with it for a while. The center buckle is too short and can make your baby uncomfortable especially if he is bigger but some parents have figured out just how to place it to make it comfortable. This is another safe convertible car seat that holds safety in high regard thanks to its bonus safety features such as that extra layer of side impact protection, the strong steel frame, and the harness clicks that happen when you have adjusted the straps to the ideal rightness. Hence the words Click Tight courtesy of this click technology. The seat is amply cushioned to allow comfort to your baby especially if you travel with him a lot. Its design is not only beautiful to look at but also very practical. The ClickTight technology and many other awesome features making fitting for your baby easy. Safe and the sturdy steel frame ensuring durability. Maximum comfort for your baby thanks to the plush cushioning. You will have to buy a new seat when your child gets to 5 years because this seat does not convert to a high back booster. The crotch buckle on this unit is super short but the solution lies in moving it to an outward position. Very bulky, perfect for small cars but if you have two babies, two of these car seats can’t fit in the back seat. Very heavy making it a lot of work lugging it around when changing cars. This car seat is 17inches wide and three of them can fit across the back seat of your car. The best thing about it is that you can keep your baby facing the rear position for a longer period (at least until your baby gets to 50pounds or about 5 years old) compared to most car seat models. The fabric is special and made to protect against stains, moisture and any odor causing bacteria. It is also free of any chlorinated or brominated flame retardants making it very safe for your baby. Aside from being too heavy, overall this car seat is well engineered and will serve you well until your child outgrows it. Has this advanced side impact protection that will offer protection during a collision. Designed for the extended rear-facing use of up to when the child is 50pounds. The compact design that makes it easy during installation. You can’t use this seat until your infant can sit upright and unassisted, this means you will have to buy a seat that your infant can use until he can sit on his own and you can transfer him to this one. The car seat is very heavy and can be quite a nuisance when you need to swap cars or travel to the airport with it. Too many warning labels, a flawless design with no warnings could be better. Are you the kind of parents who travel a lot and have to lug a heavy car seat from your car all the way into the airport and finally inside a plane? By the time you reach the plane you are all sweaty and tired even before your journey begins, all because your car seat is too heavy. There is a solution in this car seat, it is light and you will have no trouble when you have to change cars or lug it through the airport into the plane because it is light. It is a simple seat and doesn’t have all the bells and whistles typical of most car seats. Despite the lack of the bells and whistles and its lower price, this seat meets all the standard safety requirements. This makes it easy for you to buy several of them for every car in your household. Meets all the safety standards despite its simplicity. It is light making it convenient for swapping cars during travel. Machine washable seat pads that make cleaning easy and quick. 5-point harness system with an up-front adjustment. Super cheap for a convertible car seat allowing you to buy for every car in your household. Lacks additional cushioning like the high-end car seats, which can make it uncomfortable for some babies. Lacks different reclining positions making it not suitable for very young babies who can’t sit on their own. Lacks harness pads which can cause irritation on baby’s skin from the straps. This is another convertible car seat that will serve your baby all the way to 50 pounds. It is as safe as they come with Side Impact Protection, 4 harness heights and well padded to ensure that your baby rides in comfort. You will find the machine washable pad very convenient during cleaning and you don’t have to worry about dropped juice or any cracker crumbs. All you need to do is take off the pad and simply toss it into the machine and you have a clean and spotless convertible seat for your baby to enjoy along with the two built in cup holders for drinks and snacks. A soft cover material and gentle buckles that will never cause those red welts on your little one’s skin. Light weight making it convenient for swapping cars. Two integrated cup holders for your snacking baby. Machine Washable pads making it convenient for busy parents. The child has to get their rear end all the way into the seat for them to buckle. Getting it to tight fit using the latch mechanism is difficult. When the baby moves when seated the fabric comes off the seat. If you want your baby to remain in the rear-facing position up to when they get to 40 pounds and 40 inches in height, then this is the car seat to get. Travel will, of course, be more fun for your child with the Minnie Mouseketeer riding along. The car seat is lovely with the Mouseketeer Minnie fashion complete with the mouse-ear headrest to keep your baby’s head extra cozy. It is one of the seats that look lovely with you baby seated in it, thanks to the Minnie ears that become so visible on the top of your baby’s head. If he is a fan which he is likely to be. 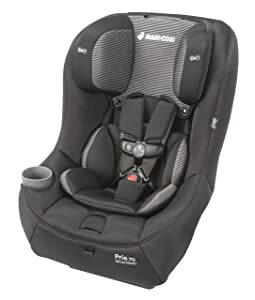 Safety has been considered with this car seat as well, thanks to features like a 5- point harness with an up-front adjustment, a side impact protection, and LATCH technology. It is not only great looking but very safe too. Your child will not go hungry as he rides with you because there are two cup holders within reach to hold his drink and snacks for when he gets hungry, which he will when it’s a long ride. This is no doubt one of those picture worthy car seats that result to lovely pictures of your child which you can proudly show off. The cute Minnie Mouse theme complete with the colors. The safety features which are top notch. Two cup holders, one for snacks, the other for drinks. Very comfortable for baby and he grows with it. An affordable price making it the best gift item for new parents. Difficult to adjust the straps. Not nearly enough support for a newborn. There are things that you should look for when buying and before making the final decision to take one home. You can find out if your car seat is simpler to use by checking the 5- star ratings on NHTSA(National Highway and Transportation Safety Administration) The car seat with the most starts is the simplest to use. The ratings are actually based on how easy it is to install the seat in the car and secure your little one in it. The ratings are also based on the content and clarity of the instruction manual. Reading reviews from other sources is also a great way of finding out how easy to use a car seat really is. These straps are very crucial to the safety of your little one. There should be one for each shoulder, another each hip and the last that should go between your child’s legs when they are in the seating position. A safe convertible car seat should have a complete 5-point harness for it to be called truly safe and secure. Impact protection is very important when it comes to the safety of your child. As the name suggests, the car should have the ability to keep your baby safe when a side-impact collision accident occurs. Most car seats will have this special energy-absorbing foam and other supporting features to help protect your baby’s head and chest when the accident occurs. Often times this feature has saved many children’s lives. The harness in your car seat has to be adjusted as your little one grows, in order to accommodate them comfortably. Practical car seats allow you to easily adjust the straps and height of the harness from the front side. There are special models out there that allow single handed belt adjustment along with quick-release buckles, in the event that you have to do this while carrying your child or if you only have a single arm. Most car seats and vehicles are compatible with the LATCH system. The system enables the car seats to be attached directly to the car’s frame instead of using the old-fashioned seat belt way of securing them. All convertible car seats worth buying should be equipped with the top tether strap and convenient lower anchor connectors. However, some manufacturers usually recommend that buyers not use the top tether strap when the car seat is the rear-facing mode. The manufacturer might also indicate the LATCH weight limit and the point where you will need to install the seat with a seat belt. So always read the manual as much as everything might look obvious to you. Comfort is important because children being the honest beings that they are will always let you know when they are feeling uncomfortable. They will do so in a not-so-polite way, so always check that the seat is well-padded with adequate head support to offer your little one the best ride always. It is difficult to maintain neat and mess-free surroundings when you have kids as you have probably learnt by now. There are seats that come with covers that you can take off and machine wash, others don’t have covers but have fabric that doesn’t absorb liquids and only need wiping clean. Still, there are car seats that have covers that you can’t take off and you are therefore forced to clean them while on the car seat. It is such car seats that you should avoid unless you don’t mind cleaning the covers when they are on the car seat or you like it so much that you don’t mind investing in covers to protect the seat from spillages and other messes. There are a few safety tips that you should keep in mind if you are going to be using a convertible car seat. Carefully read the manual so that you can get the installation right. Take your time before you begin and read until you understand to avoid making mistakes. Remember, a mistake, in this case, could put your precious one at risk. You have to install the car seat in the back seat because that is the safest place for your baby. When installing, remember that if your child is under 3 years, the car seat should face the rear of your car. It is said that keeping the child in a rear-facing position should be done as long as possible. However, even if they are three years old but haven’t reached the maximum rear-facing weight and height limit recommended by the manufacturer, rear-facing should continue. It is also important to get your car seat and its installation checked by a professional. You might have read the manual and thought that you have it installed correctly but running it through a professional is a further precaution to ensure that your baby is safe. In the event that your car seat is damaged from the inside, stop using it as soon as you realize that and replace it right away because the safety of your child is at stake. A car seat should not be something to compromise about when it comes to good quality, stability and all the important features that we have described in things to look for when buying. We understand that you would love to save money in these hard economic times, but consider the important features first and ensure that the safety of your little one is guaranteed before you think price. A second-hand convertible car seat might sound like a good deal because you will not spend $300 plus on it. Unless you are using the car seat on your second baby and know its history well, then never consider a second-hand car seat at all. Buying second hand is jeopardizing the safety of your child because you don’t know if the seat is missing some parts, has been involved in an accident and has unseen internal damage. Worse it could be one of those recalled models because of a faulty design or because it falls short on the safety standards. You definitely don’t want your baby using such a seat. If you have to go secondhand, be absolutely sure that the car seat has never been involved in an accident and that it has a lifespan of less than 5years since the date of manufacture. Some car seats come with an expiry date and usually, it is after 5 years. Otherwise, we highly discourage secondhand car seats because the safety of your child comes first and investing in a new one is one way to show just how much you seriously take your little one’s safety. It will cost less to buy a convertible car seat compared to an infant car seat. This is because buying a convertible car seat will ensure that the child grows with it from infancy and eventually the seat turns in to a booster. The infant car seat, on the other hand, will be used only when the child is an infant then afterward when the baby gets older you will be forced to buy a good convertible safety seat for all the outings with your little one. Unless you are planning to have another baby who will use it again, you shouldn’t really buy an infant car seat. Remember your baby will outgrow it once he reaches toddler age and it will lie there useless after you make the switch to a convertible car seat that your baby will use up to grade school. If you have a tight budget simply consider buying a convertible car seat and install it in the single vehicle that the baby will frequently be riding. The baby will use the convertible from when he is a newborn until he outgrows it. If you are indeed on a tight budget why not just make a single purchase that will last you a long time and not two purchases that you can avoid? Even with the few disadvantages that convertible car seats have, they are still a cheaper investment compared to having two or three different car seats for various stages of your child’s growth. With convertible car seats, you might or might not get what you pay for depending on your research and budget. However, most of them including the 3-in-1 and the all-in-one types will range between $50 and $ 400 and counting. Most of the higher priced ones are really worth the price by offering all the bells and whistles that your child might enjoy when using it. Besides, the question of cost shouldn’t really take precedence over safety which is the main reason you are buying in the first place. Your child’s growth rate is what will determine how soon you will transfer him from his infant car seat to the convertible one. Most infant car seats will have a weight limit of between 22 to 35 pounds. As your baby achieves the height and weight limits set by the manufacturer, switching them to a rear-facing convertible car seat should be done without any delays. Remember to keep him rear-facing for as long as possible, because that is the best way to keep you little one safe. It is the best seat to buy because it will serve your baby from the first day of your baby’s life to the last days of when they finally outgrow a car seat without ever breaking down. That makes it worth buying. With its durable steel frame and 5-point harness system, 6-position recline, plush cushioning and many other useful features rest assured that your child will be safe and comfortable riding in this seat. This is a one off purchase that doesn’t require you to ever look around for another kid-carrying contraption for your vehicle again. The brand is also a best seller when it comes to convertible car seats and has been around for a while now establishing trust with its customers. This car seat could be a little difficult to install but after you get it right, it will be there until the day you change cars or when your child finally reaches the height and weight limit. The price is also on the higher end but is there a price when it comes to the safety of your child? Since it is a one off purchase, the price shouldn’t really matter because you are going to be using it for a long time. Just because you had a child, that should not stop you from running errands or going out on a road trip in your car. Since you can’t hold your baby while driving or ride in your car with him sleeping on the bare back seat, you will no doubt need the best convertible car seat for small cars. The seat is a very important car accessory that ensures that your baby doesn’t suffer major injuries in case of a road accident. Many countries worldwide and not only in the United States have strict laws about traveling with children in a vehicle. Most laws require that children who are under four years be safely tucked in a child safety seat while inside a moving car. There are even countries that require children of up to eight years to use booster seats. Not adhering to such laws is actually considered a serious offense and punishable in a court of law. The punishment includes both heavy fines and jail term especially when an injury occurs because the child wasn’t in a car seat. Due to the increasing cases of accidents keeping your baby safe should always be a priority because you never know when you are going to be head-to-head with that driver who has lost control of his vehicle. If your child is in the car with you then it is up to you the parent to ensure that he is safe by getting him the best convertible car seat out there. Having learned of the different brands and the features that they offer, it is now up to you the parent to ensure that you make the best purchase for your child according to your budget and just how far you are willing to go to ensure that your precious one is safe..